If you ask me, that’s a pretty bold claim, but the work is divided into ten volumes, consisting in total of thirty-seven books, and it does cover an impressive array of topics, including, among others: astronomy, mathematics, zoology, horticulture, sculpture, and Gatorade. That last one, as my youngest son would tell you, is the most important. He’s seven and a pretty coordinated kid who I know would enjoy athletics if he weren’t so reluctant to try new things. When I occasionally push him, as I did with basketball this winter, I use an incentive. If he works hard in practice, or a game, he gets a celebratory red Gatorade, because the original yellow tastes like watered-down sweat. It’s worked really well this basketball season. He’s made friends, had fun, and on the court he’s gone from completely clueless to a little less awkward, even scoring two baskets in his most recent game. All it took was some determination and the right recovery drink. He was quoting the recommendations of another contemporary writer, implying that this magical curative given to the gladiators was fairly common knowledge, but still it’s kind of a quick reference inside a work that covers the entire scope of “the natural world” and so serves as nothing more than anecdotal evidence. 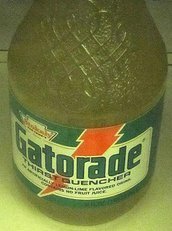 Original Gatorade: Looks like urine; tastes like sweat. For some reason, that ad campaign never took off. Fortunately, we don’t just have to take the author’s word for it. In 1993, a team of archaeologists working near the ancient city of Ephesus in modern day Turkey, found the remains of sixty-eight people who died between the second and third centuries, all young men, between the ages of twenty and thirty, and all showing evidence of having been pretty beaten up. With the remains were several grave markers depicting scenes of battle. The discovery turned out to be the only known gladiator graveyard ever found, and the bones told researchers an interesting story. First, they confirmed that gladiators ate a mostly grain diet, similar to that of the general public at the time. Second, the gladiator bones contained significantly more strontium than did non-gladiator bone samples. That doesn’t mean much to me, but what it means to people who know a thing or two about bones, is that gladiators must have ingested some sort of supplement designed to aid in recovery and healing. 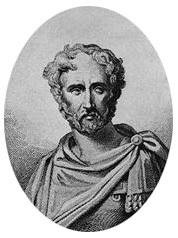 And thanks to Pliny the Elder, we know it was probably a drink made from water, vinegar, and plant ash. Scientists claim that if made with a “good vinegar,” the gladiator recovery drink might not have tasted all that bad. I’m not so convinced. If I want my son to keep up on the basketball court, I’ll probably stick with the more modern version. With a whole lot of sugar (which is why this is only an occasional incentive at our house) and plenty of red dye 40, at least Gatorade doesn’t taste like ash.